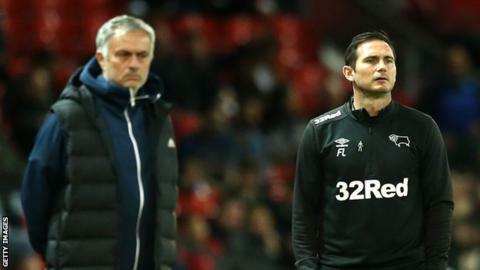 Derby manager Frank Lampard has praised the response of Manchester United boss Jose Mourinho to the Rams' shootout win in the Carabao Cup third round. Lampard, who played under Mourinho at Chelsea, said: "I was so honoured to be on the touchline with a man who affected my career so much. "Through those young mid-twenties, he upped my level and Chelsea's level. "He was very welcome [in the dressing room] and very complimentary at the end about how the team play." Championship side Derby almost beat United within 90 minutes, coming from behind to lead 2-1, but Marouane Fellaini's late equaliser sent the third-round tie to penalties. After 15 successful spot-kicks, five-time winners United were knocked out when Derby goalkeeper Scott Carson saved Phil Jones' effort. Pogba and Mourinho - is it a fight the manager can win? "[In the huddle] I said I was proud of them and I couldn't care less whether we won or lost," Lampard, who is in his first season as a manager, told BBC Radio Derby. "It didn't matter to me. I didn't care, because I was so proud." This was the first time Lampard had faced one of his former managers in the technical area and a famous victory at Old Trafford has given him the thirst for more special wins in the dugout. "It was great," he added. "I want to do it more. I enjoyed the night. "It was a great experience for me personally, but a great experience for all of us that we got the result."